Now I’ve whetted your appetite for pickles, we can move onto kimchee. 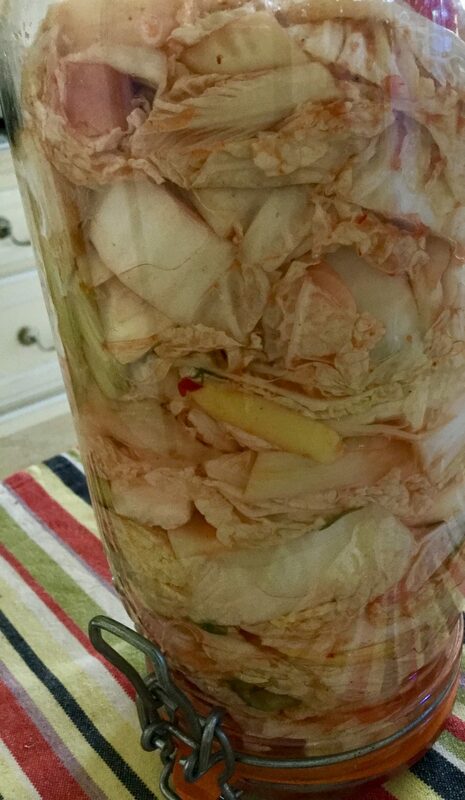 The backbone of most recipes is the white Chinese “napa” variety of cabbage with its wide stems and pale, crinkly leaves, large white radishes, ground chilli, garlic, chilli sauce and rice vinegar. Some versions, like this one, include fish sauce and ginger – a few neither. True Korean versions are masterpieces of the art but are often too stinky for me. My own is far from authentic Korean. Of course I want heat. Not your actual teary-type heat, but at least enough to make your eyes sparkle. I don’t use the Korean gochujang chilli paste but ordinary red chilli paste, as I’ve yet to find the former in Nice. 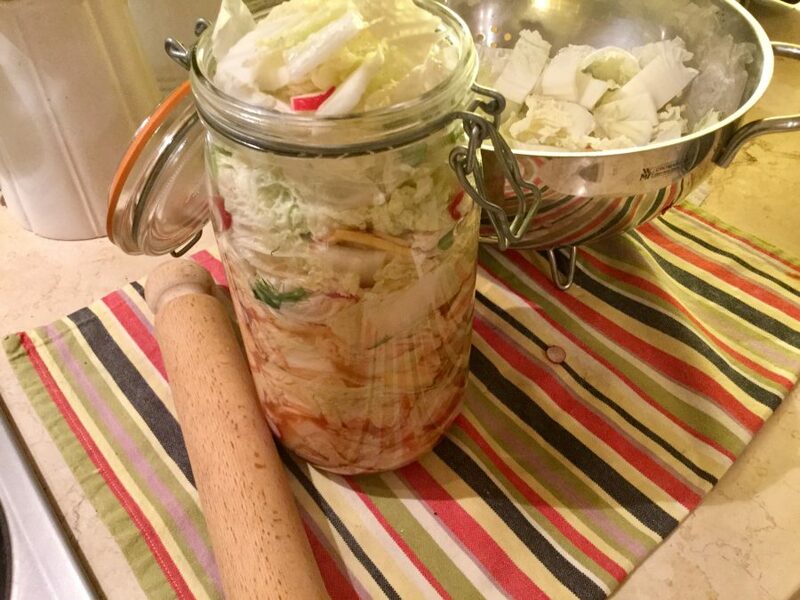 Plus, I shy away from leaving the salted cabbage several days to ferment at room temperature – the process that makes kimchee kimchee – partly out of impatience, and partly because I like the crackle of the crisp veg. So mine is more a crunchy, hot, salty, sour condiment – and is none the worse for that. It is sensational with absolutely anything. 1. Halve the cabbage, remove core and shred it roughly. Do the same with the red cabbage (if using) or fennel. then put both in a colander and rinse under cold running water. 2. 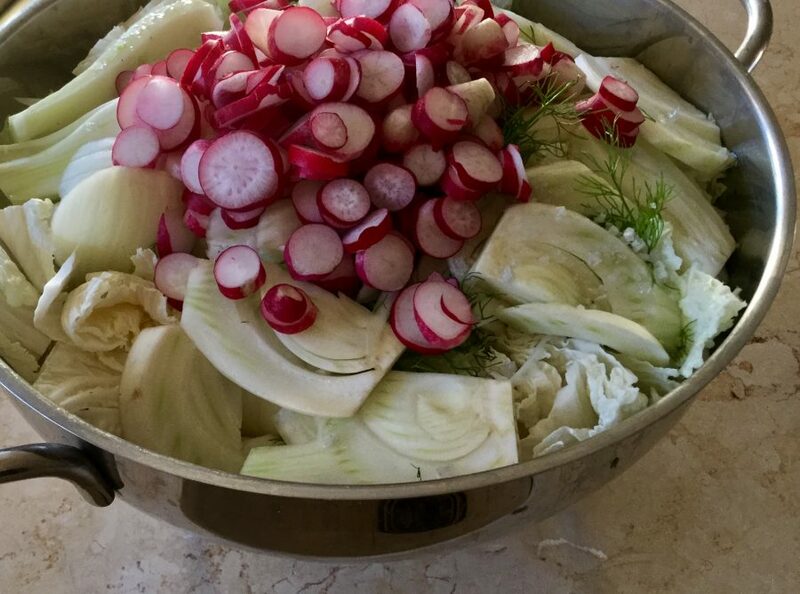 Slice the radishes into quarters or thin slices, then mix with the cabbage and tip into a bowl. Scatter the salt over. Place a plate on top of the cabbage, put a heavy weight on top, and set aside in a cool place for 4 hours. 3. In a small bowl, mix together the rice vinegar, fish sauce, chilli paste or chilli flakes into a soft, deep rust-coloured sauce. 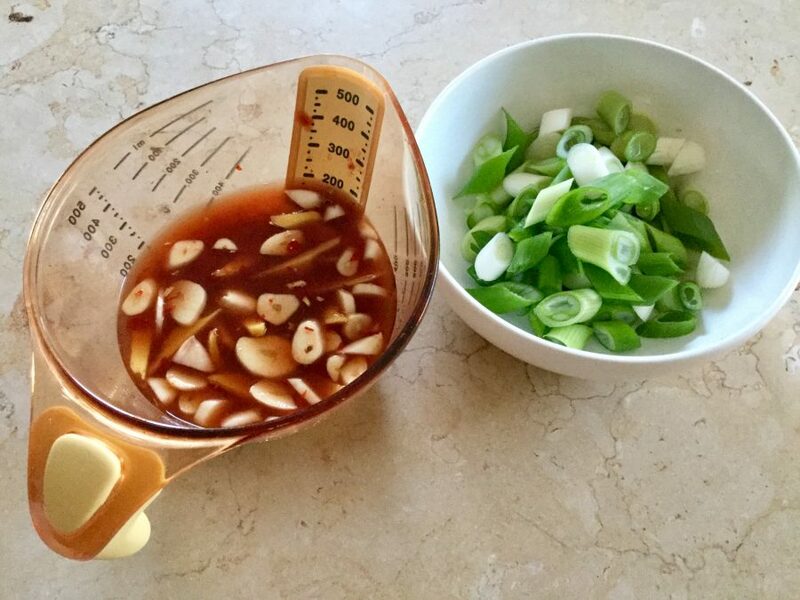 Peel and finely cut the garlic and ginger into paper-thin slices and add to the sauce. Slice the spring onions, stirring them also into the sauce. 4. Rinse the cabbage in a colander, removing much of the salt. The cabbage will have relaxed. Transfer to a large bowl then tip in the chilli dressing and toss thoroughly to coat the leaves. Pile into the clean storage jars, pushing down – I use a rolling pin – to eliminate spaces, seal and set aside in the fridge for 4 days. 5. Turn the jars upside down each day to encourage the dressing to trickle over the vegetables, keeping them coated. 6. Four days later, dive in! I love it on sandwiches, with felafel and even straight from the jar! 1. Sterilise your preserving jars with boiling water and let them drain, or bake them at a low temperature in the oven for 10 minutes. This batch will fill two 1-litre Kilner jars or one 2-litre one. It will keep, for a couple of weeks, in the fridge. Turn the jars over every few days. 2. Once ready to eat, it’s amazing how many things you can eat it with. 3. Feel free to change the ingredients but maintain proportions.